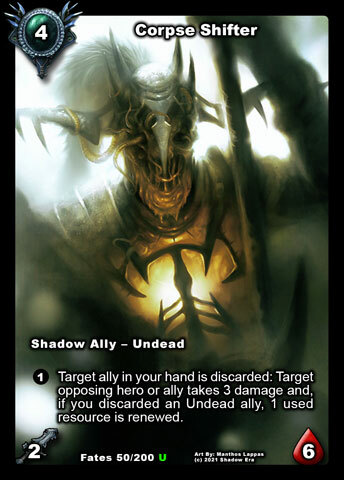 The Undead Alignment is one of the most synergistic alignments in Shadow Era, and also the most versatile. 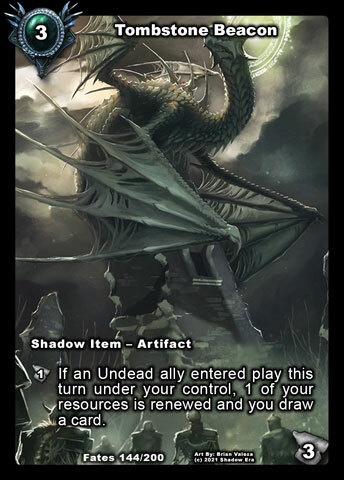 This is most likely due to having available Undead alignment cards as early as Call of the Crystals and having been constantly added with each of the subsequent expansions up to our current Lost Lands Expansion. The tribe in general has an overall feeling of aggression and being hard to get rid of …. completely. This guide is an evolving article which will change periodically, depending on balancing card changes or a change in my though process after playing more with the cards. Special thanks, as always, to Gondorian, Starval, and BobRoss for input! 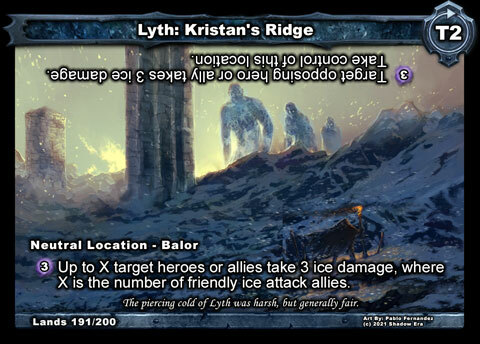 Notes: Frostmare is typically not seen much play outside of boosted attack haste decks (Shard of Power, Raikka, and Rothem). Personally I tend to use him in some of my builds for his tempo plays. The reduced summoning cost of his ability is generally what I am drawn to most, combing with Tombstone Beacon for potential net resource gain; as a easy combo with Pithing Spear; and possibly as a cheaper alternative to Death Mage Thaddeus in decks that have other ways to deal with stealth. Frostmare is good tech against human rush decks, being able to take down a Turn 1 Kris, and provide possible Turn 2 swarm with another 2 cost ally. 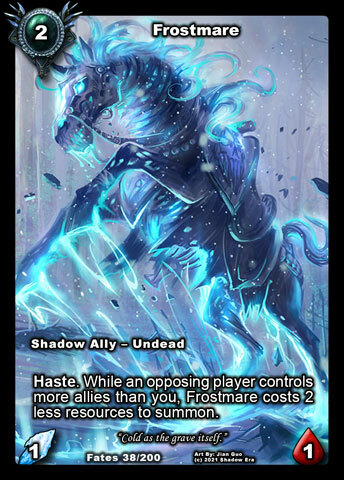 In general because of the potential “free” cost, Frostmare also combos very well with cards needing a friendly ally source in play (attachments, Sacrificial Lamb, Energy Discharge, etc). Notes: Currently he is the go to 2 drop for the Undead Alignment because of the 2/3 stats which is great early in the game. 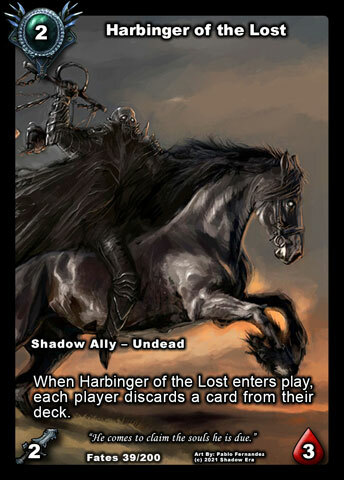 The discard function of his ability allows him to assist with possibly discarding other Undead allies to help get to graveyard requirements of allies such Cryptspawn Tormentor and Der’kan, as well as creating potential targets for use with Shadow Knight and Necromancer’s Shroud. The discard occurs from the top of everyone’s decks so you can also use him to alter top cards of yours (Meat Wagon) or opponents decks (Scrying Eye). 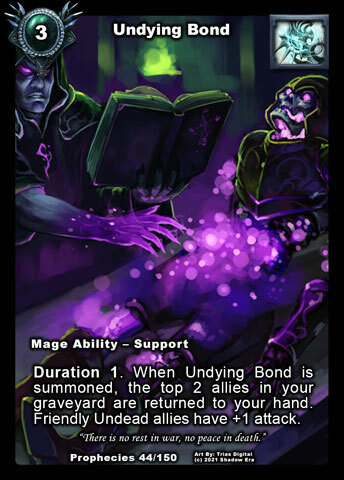 The discard function is also something that can be built around outside of the Undead so he is often used in other decks (Mill, Homunculus, etc). 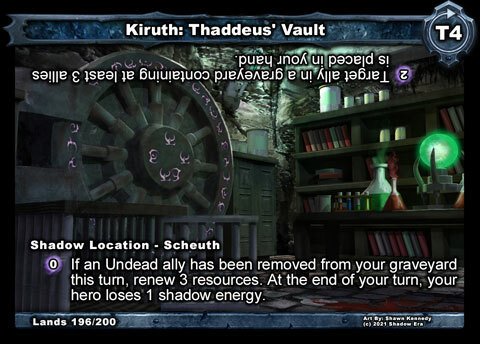 Notes: Kiruth Devotee is an excellent addition to the 2cc pool of Undead allies. His stat line really opens up the early game options for those decks not wanting to run Harbinger due to his self discard or other non-undead options. 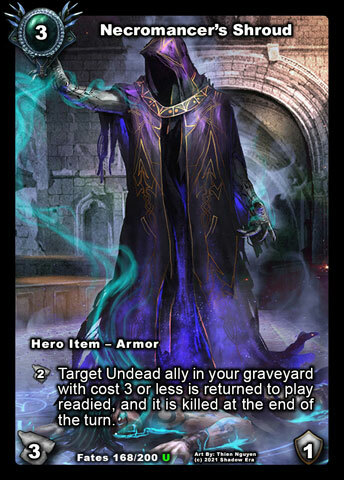 Devotee will play favorably with Heroes and decks that can create tempo swings (Vess, Baduruu, Zaladar, Jeweller’s Dream, Feedback, Kiruth: Thaddeus’ Vault, etc) since he has a fairly costly ability and he really will need assistance in killing marked ally. While the cost of ability is high the benefit is worth it. It becomes essentially draw and play this (marked) ally with vanilla stats. That is quite a bargain for 3cc, but of course you need to build around being able to capitalize on killing that ally fairly routinely. Once you can get rolling your newer allies can start assisting in kills for you. 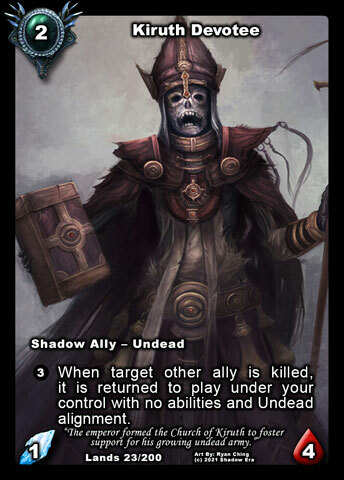 It is also interesting to note that newly recruited allies will have the Undead Alignment so they will synergize with cards like (Undying Bond, Grave Resistance, Charred Cowl of the Damned [NOTE: Non-Enflamed (un-marked) Vanilla Undead allies killed while you control Charred Cowl of the Damned will return the ally to play under your control with its original card stats and abilities, if any]) When you have another ally marked via Kiruth Devotee’s ability he acts sort of like a protector in that your opponent will want to kill him first to make sure ability is not able to kick in. Some Information in Forum Card Thread about SRO in relation to allies killed while marked (below for quick reference). Case 1: If i have Charred cowl of the damned, and a friendly ally with Kiruth ability on. 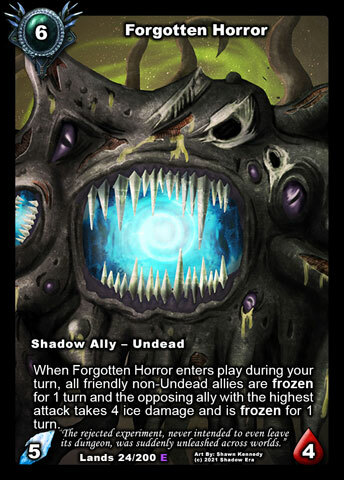 In board: CCotD + Kiruth + other Undead ally (Anyone, let’s call him PoorAlly) : PoorAlly is with Kiruth effect activated. My opponent kill the PoorAlly, so he can returns at board by 2 ways, by Kiruth Effect like a PoorAlly without abilities, or like the normal PoorAlly in Blaze by CCotD. But reading the Ruling, if i understood well, say that allies effects should resolve first, so PoorAlly should returns to board like a Undead PoorAlly without abilities (By Kiruth Effect, and ignoring CCotD). 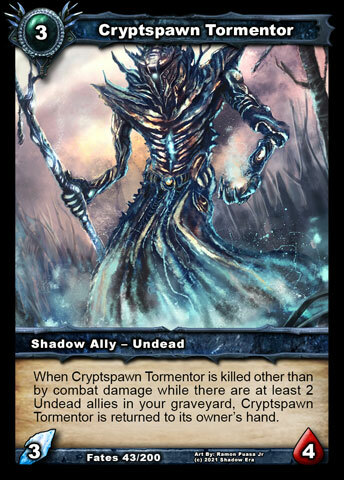 Case 2: A extension to the example, what happen if the ally is Cryptspawn Tormentor (with undeads in the graveyard) ? Case 4: What happen if i control Kiruth + Eternal Troll (Original, with passive ability) and i use Kiruth ability? 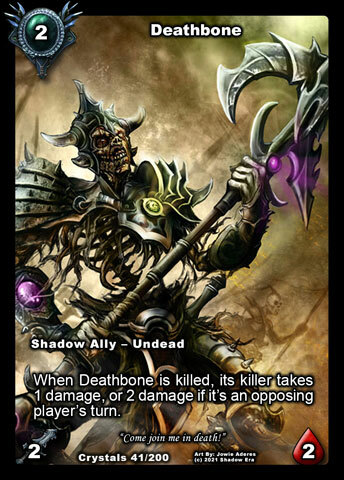 Notes: Deathbone has been around since the beginning of the game, and is not a very popular Undead ally. His ability is one that looks good on paper, however the actual execution is a bit lacking. This generally is due to having low health and the opponent getting to choose how he dies and where to absorb the 2 damage. He has some good synergy with existing cards like Bone Sabre and Necromancers Shroud to assist with directing the on death damage source however, you can typical get better value from other allies using the same tricks and keep deck building options tighter. He should have some synergy with new comer Kiruth Devotee but same limitations will exist. He can be good tech if you know you are facing opponent with Evil Ascendant. Deathbone also has synergy with Raikka’s ability to boost damage dealt from death or combat as well as increae surveability. 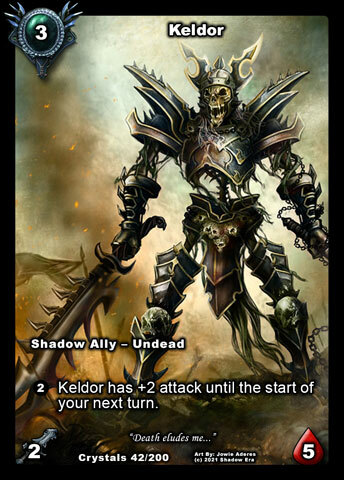 Notes: Like Deathbone, Keldor has existed from the beginning of the game when alignments had not yet been fully designed. Unfortunately he is a weak ally that is made weaker by the existence of Death Collector. Keldor could have potentially made a great 2/5 ally (which the tribe is missing). There are not many decks where you can run this sub par ally because there are just too many other good options to choose from. The only instance where I might choose to run Keldor is as tech if I know I am facing Elementals most likely running Mind Control where I can spot use the ability around Mind Control. Notes: Death Mage Thaddeus has been a strong Undead ally since the beginning. He creates that additional 1 damage source needed sometime to take out opposing allies while still be able to put a body on the board. He is also able to bypass stealth which keeps him as a favorable option for almost any build. Later sets have created potential replacement allies but they are different enough and have differing cost that Death Mage Thaddeus should remain a strong consideration in deck building. Notes: Death Collector is a strong 3cc ally and is flexible enough to be considered outside of Undead builds. With the potential to grow stronger from his activation ability he can be considered a Mini-Fatty or Fatty-Lite. This flexibility put him in good company with other fatties as he can stay on the board (save other fatties) and grow, seeking targets of removal from opponent. Additionally he is able manipulate any graveyard creating a nice tech option against decks revolving around graveyards. Death Collector also pairs favorably with resource renewal effects. Notes: Tormentor is one of the Undead allies you are least likely to see in non-undead builds. He is essentially a vanilla ally until you hit achieve the graveyard requirement of 2 Undead allies in your graveyard (usually mid-late game). Once this happens he becomes a solid ally choice as all ally removal/board wipes are all abilities. He is excellent tech / bait for board wipe heroes. He has lots of Undead synergies but can at time not play well with other alignment cards that remove allies from the graveyard. Most favorable pairing cards are with Necromancer’s Shroud and Sacrificial Lamb. 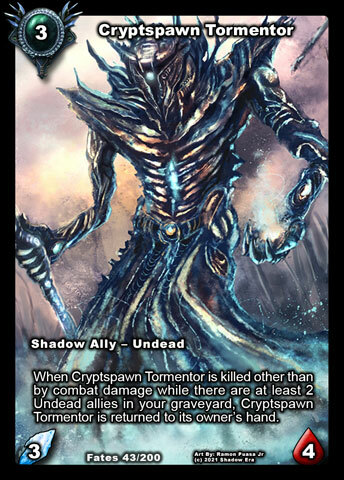 Notes: Corpse Shifter synergizes very well with the Undead but his ability requirement, of needing Undead allies to discard, limit him from consideration as a splash ally. He has high health which makes him a great turn 4 option and good choice to start absorbing damage or removal that other allies might normally receive. When building a deck containing Corpse Shifter you need to pack lots of draw (including Shadow Knight) so that you can keep his ability relevant for prolonged periods of time. 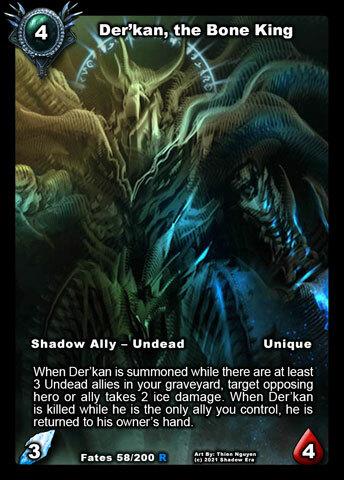 Notes: Der’kan is the hardest Undead ally to use, having he has both positive and negative synergies. Der’kan compliments the Undead Ping Strategy very well but he really want to play by himself to achieve his best strength of self recursion. This is made stronger when he achieves his graveyard requirement so he can use his summon ping to help control the board or go for the hero to help finish the game. He plays well with self removal cards, being used on himself or other friendly allies to keep his solo state in effect. He is excellent against board wipe as long as he is last on the board he will bounce to hand on death (he would be last in play when his check down occurs – SRO). Due to his difficulty of use, he is not seen used as frequently. He does not play well with cards removing allies from a graveyard (except Necromancer’s Shroud) unless you can keep the Graveyard Requirement in check. 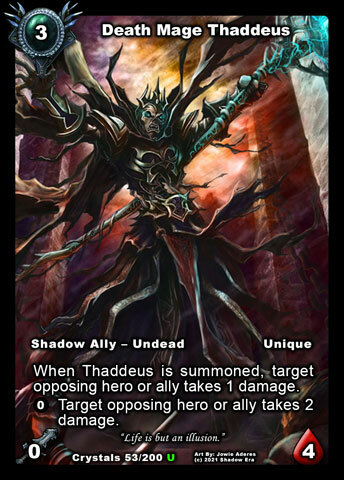 Notes: Like Death Mage Thaddeus, Shadow Knight is a common fixture in builds outside of the Undead Alignment, especially those relying on allies to fuel a particular strategy. Being able to place threats on the board while selecting known allies from your graveyard, including other Shadow Knight to potentially create a looping effect. He has very good aggressive stats so he combos favorably with Haste cards. Notes: A fatty undead ally with an enters play ability to damage and stall (1 turn) an ally if not killed. 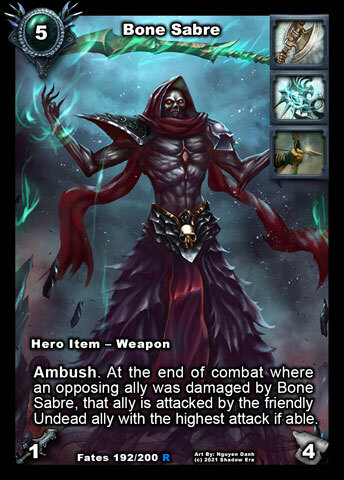 This is actually a really good ability on an ally and works favorably with tempo play heroes like Baduruu and is a much needed type of ally for Gravebone with impactful enters play ability. He can pair favorably with Bone Sabre for some additional board control, as well as Charred Cowl of the Damned (NOTE: If Forgotten Horror is killed on opponents turn and returned to play by any source, his enters play effect will not trigger. Must be on your turn). Due to the stall-ish nature of his ability it will not surprise me to see him appearing in stall decks and/or freeze decks (looking at you Stalactitan for synergy). Notes: At such a high cost he has to be considered an ally designed with Gravebone in mind. This guy is a Sandworm on steroids and if you build your deck properly you can get him on board by Turn 3-4. Generally if Dakrath sticks for a Turn you have a strong chance of winning the match. While he does not have Steadfast he has some nice built in features that help with some specific match ups using either Freezing or Disabling Tactics. 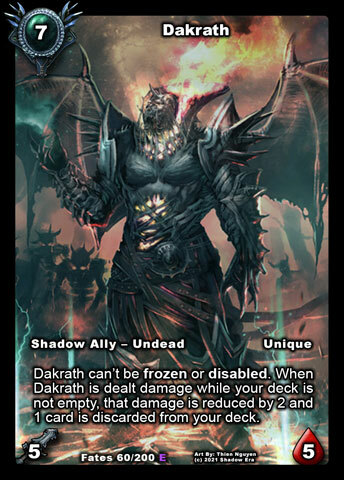 Notes: Excellent card for decks seeking to have these allies survive by turning all your Undead allies into Gargoyles. 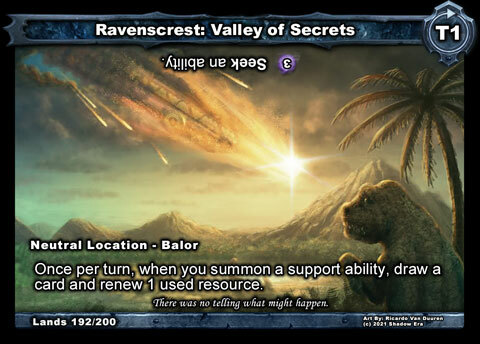 No cost means you can always time it properly, but you will need to be able to draw cards very successfully to compensate the card lost from hand. This is an excellent support ability in a category that is rather underwhelming for the game. Note this is an excellent tech of you are facing Banebow reducing his Hero Ability effectiveness. 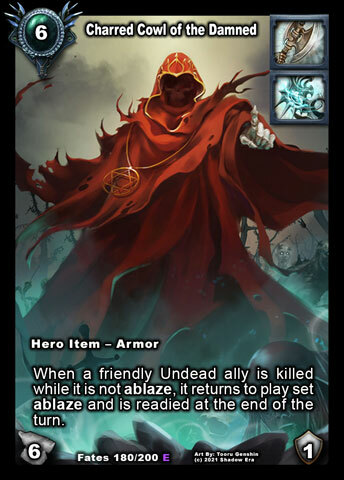 Notes: There certainly a real synergy with the Undead Alignment and what this card offers, however the actual use of this card is very limiting. 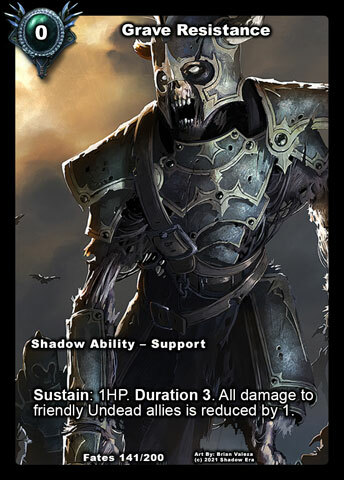 Lots of the Undead allies have a recycle ability either on self or others so often this can simply be left out of the deck building process and a similar effect achieved. The cost is also a bit high to combo play with, potentially resulting in a pass on playing at the board. The attack boost is hard to time consistently. You can get some good use with Corpse Hurler since he has high health an generally harder to remove and Undying Bond can help reload your hand by providing ammo for his discard outlet on same turn. Potentially Recycling Frostmare is also a possibility (didn’t say a great combo) as you can get free hasted 2 damage in the right scenario. Grave Resistance is also a potential combo to help Undead allies survive so that the attack boost can be relevant. 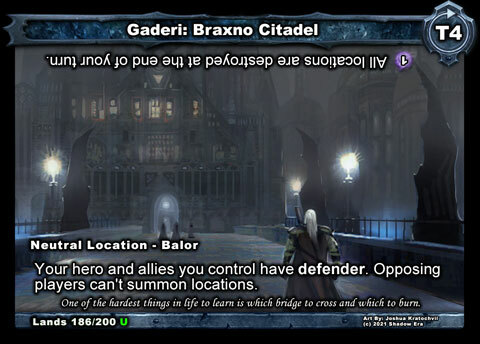 What is interesting is that Human Mages can use this card as well to retrieve the top allies of their graveyard however no human cards are Undead Alignment so the attack boost will always be irrelevant. Notes: This is a great draw engine by design, theme and synergy, but it is currently limiting with which Heroes/builds can use it effectively. You have to be able to capitalize on 3cc tempo loss, and then have an appropriate build to capitalize on both the draw and resource renewal (+1) which generally is not until later in a match. If you can build your deck properly, the resource renewal can prove to be valuable in getting a game changing combo in play. Notes: This card is probably one of my favorite cards in the game. Aside from being an armor, you can use the armors ability to revive an undead ally with a cost of 3 or less. This ally can be considered as a form of direct damage which is nice addition for Heroes/Classes with limited damaging ability access. 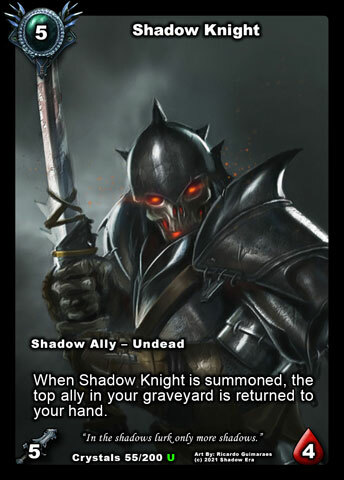 With some careful planning, you can utilize this ally in other ways such as Drawing (Sacrificial Lamb), Recursion (Cryptspawn Tormentor dying at end of turn is considered ability damage), Graveyard Clearing (remove top ally so Shadow Knight can get one below), and even keep the ally on the board by removing the armor (attack with a weapon that will receive retaliation damage, Meltdown or play another armor). Notes: Very synergistic armor for the tribe and quite different to Necromancer’s Shroud. This is very strong with allies that are hard to kill, such as Corpse Hurler and Dakrath, forcing opponent to essentially deal with them twice to officially remove them from the board. The hardest part is getting set up properly but I have found that Corpse Hurler and Shadow Knight are good pairings with this armor as you can keep a steady flow of allies on the board. 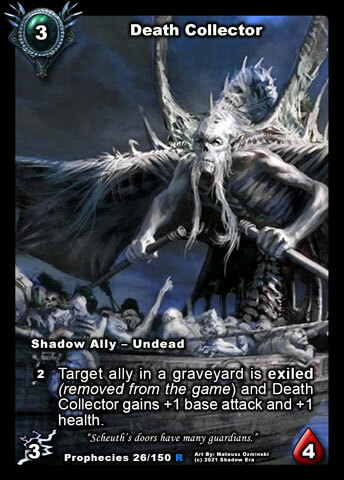 Notes: The Undead have a variety of ways to remove allies from the graveyard: Gravebone’s ability, Shadow Knight, Necromancer’s Shroud, Undying Bond, Cryptspawn Tormentor (self recycle), Der’kan (self recycle), Charred Cowl of the Damned, Death Collector (on own allies), Kiruth Devotee (own allies), Arthyle’s Crypt, Eternal Renewal, Soul Reaper, Infinity Core, Ghostmaker, as well as being able to trigger off of Anmor’s Call. There are other ways to get cards out of a graveyard that exist other than those listed above. Your deck should contain enough ways to capitalize on the extra resources gained as well as having enough draw to make it worth your wild. Notes: There are tons of undead allies that have ice attack, ping and swarm potential so there will be a natural pairing with the Undead. This particular location if one of those alt hero ability types so you will not be using as frequently as other locations unless you have some SE generator. Non-Controller side is also useful but again also an alt hero ability type. Both sides are able to target hero for damage which is a plus. Notes: While not designed specifically for the Undead, most of them have aggressive stats so having defender really can increase survivability of your allies. This will work even better with weapon based heroes and anything that boost attack (War Banner, King’s Pride, Undying Bond, Bloodlust, etc). There is no downside on the Non-Controller side for playing this location. Tagged alignment, Buqs, lost lands, Shadow era, shattered fates, tribe, Undead, undead characteristics.